Your geothermal heat pump works by harvesting energy from the relatively warm earth (your energy supply source) via a refrigeration process. It then concentrates the energy, which brings it up in temperature, and finally moves it into your home in the form of hot air or hot water. This heat is always available, always consistent, and absolutely free. There are three primary ways to collect heat from the earth, and each method has its own pros and cons. The method that is best for your home is entirely dependent on the unique characteristics of your property. 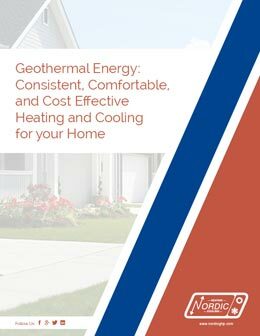 If you need help deciding which method is best for you, your nearest geothermal heat pump installer will recommend the best energy supply source for your home. An open loop system harvests heat from ground water. This is accomplished by pumping water from a well to your heat pump, which removes the heat and rejects the cold water back into a second rejection well. The entering well temperature is at least 40°F (4.4°C) or warmer depending on your location. The heat pump will extract heat from this water and return the used water to the ground approximately 6°F (3°C) cooler via a second rejection well. Once the cool water is returned to the earth, it is reheated, and can be reused. The heat pump does not add any chemicals to the water or affect it in any way other than cooling and heating it. A geothermal well is typically five inches in diameter or larger to accommodate a submersible pump. The well casing is properly sealed or grouted into rock. The water flow enters at a depth of at least 75 feet to insure reliability during dry weather. The well must have enough flow to supply the requirements of both the heat pump and the residence usage at the same time with a minimum of 30 pounds per square inch at the dynamic pumping depth of the well. If you already have a well on your property, this is the least expensive method of providing a source of energy for your heat pump. An open well system is usually an economical choice if your well has enough flow. Make sure to check with your local municipality before starting your project, since there may be restrictions on drilling in your area. A horizontal system is what we refer to as a “closed loop system”. This means the system is completely sealed and will not leak or interact with the ground water. A horizontal ground loop system uses plastic pipe buried in six-foot deep trenches. The pipe is made of high-density polyethylene plastic and about 500 feet of pipe is required for each “ton” of capacity in a horizontal configuration. A typical horizontal system configuration consists of a two pipes per trench. The trench is 250 feet long, four feet wide and six feet deep. Once the trenches are dug, a 500 foot roll of ¾” plastic pipe is installed. The pipe could be in a U shape with four feet of space between each pipe, or it could be a “slinky” configuration. These pipes will then be filled with fluid, which will absorb the earth’s heat. Small circulator pumps will move the loop fluid from the ground to your geothermal heat pump. The heat pump will remove the heat from the fluid, and it will be circulated back out to the ground to be reheated. This process is repeated over and over during the heating season. In the summer, the process is reversed, and heat is removed from the house and deposited into the fluid. The loop fluid is made of water and a freeze depressant like methanol to allow the fluid temperature to drop below 32°F (0°C) during the winter months. Horizontal ground loops are ideal if an open loop isn’t an option. This might happen if your municipality does not allow geothermal open loop drilling or your well doesn’t have enough flow to support a heat pump. Horizontal ground loops are fantastic if you have ample space (approximately half an acre) to install the trenches required. A vertical system is also a closed system. It is completely sealed and will not leak or lose charge over time. A vertical loop system uses the same technology as the horizontal system mentioned above, but instead of digging horizontal trenches, vertical systems use drilled vertical boreholes. The vertical boreholes are typically between four and six inches wide and between 150 and 300 feet deep. Two plastic pipes joined together by U-bends at the bottom are inserted into each borehole. Usually your geothermal installer will drill one borehole per ton of heat pump capacity, and most residential installations require between two and six boreholes total. The pipes are filled with a fluid that is circulated down the borehole to be warmed by the earth, and back up to the heat pump where it is extracted to heat your home. Vertical loops take up much less surface space than horizontal loops. Because of this, they are the perfect choice for city lots or any situation where outdoor space is limited.